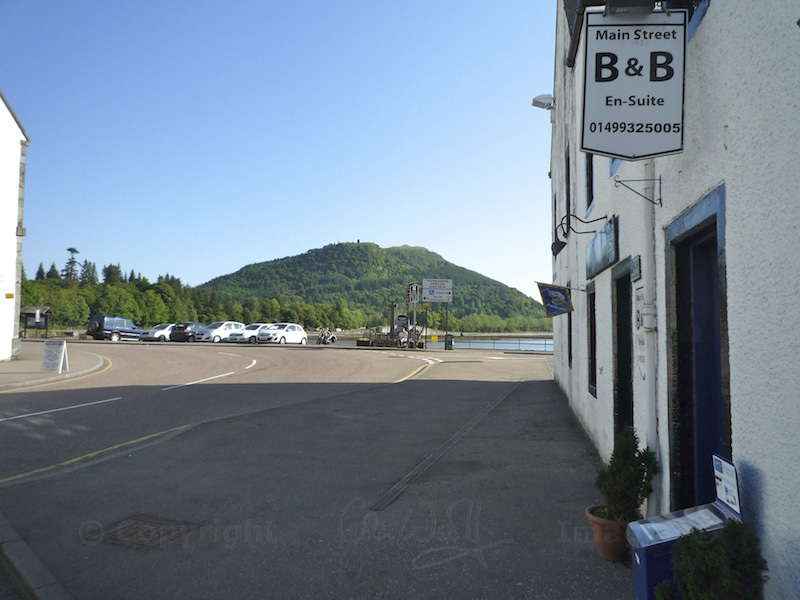 Inveraray, a little town on the shore of Loch Fyne in Argyll, is usually glimpsed as we’re passing through, quite often in search of a bite to eat, on our way somewhere more distant like Oban, Tarbert and Kennacraig, or, more recently, Loch Sween and Kilmory. But Inveraray deserves more than a passing glance, not least because of the wonderful old cross that stands on the harbour. That’s quite a long inscription for any memorial, let alone a slim cross, and it is amazing that the words have withstood the weather for long enough to be legible. The inscription is useful, because it leads historians to believe that the cross originally stood in a burial ground – but the exact position of this might remain a mystery. This is because, in 1745, it occurred to the 3rd Duke of Argyll to move the entire village of Inveraray from its original site, between his castle and the sea, and re-position it half a mile or so up the shore. As you can imagine, this didn’t happen overnight – but by 1800 much of the work was complete, and (I’d like to think) the villagers had been comfortably re-housed. 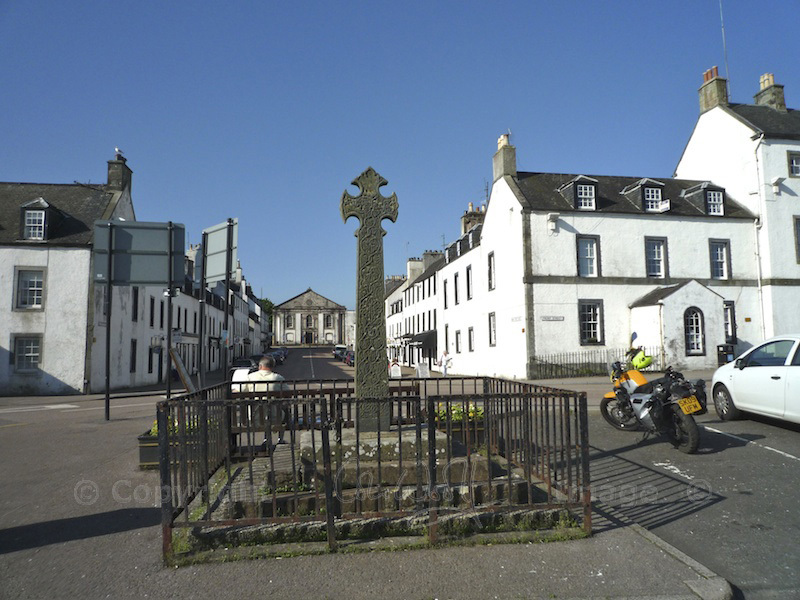 This is why the town of Inveraray, as it now stands, dates almost entirely from the late 1700s; and it has been preserved in this form, with its right-angled layout of streets and white-harled houses and shop fronts, right up to the present day. The reason for this damage isn’t made clear, but I would suggest that it might have happened during the Reformation around 1560; alternatively, it could have been done 100 years later, by troops loyal to Oliver Cromwell. Despite its quite prominent position, the cross is easily overlooked on Inveraray’s busy harbour, and it looks a little out of place there. I can imagine it standing guard over a religious site, possibly an early Christian chapel or monastery, in a field that is now probably engulfed by bracken or overgrown with trees. It could surely tell us some stories, particularly of the father, son and grandfather of the MacCowan clan whose names it bears. We just need to learn to listen! 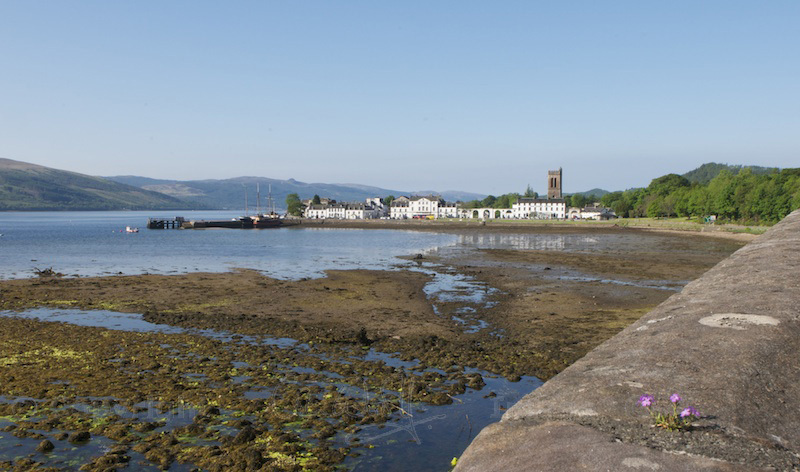 You can also read more about Inveraray, one of the prettiest towns in Argyll. this is very interesting to me. I stayed in Inveraray last year and I remember seeing the cross. I had no idea the town had been moved in 1745 and I remember thinking how well-kept the town was and how it felt very historical. I had the most amazing fish and chips there and stayed in a wonderful bed and breakfast … rudha na craige house. I’m glad you are interested in it too! I love Inveraray, and I love its cross although it was some years before I even realised it was there (I’m ashamed to say!) We like the fish & chip shop too! Very interesting and beautiful!. Thank you for sharing. P.S. : Jo, WP is making trouble for me to post comments in this site (in your journal is fine). Even signed in, it rejects my comments with “Error cannot be posted”. Hope this second intent works. Hi Carmen, I’m sorry to hear that – I was having similar problems about a month ago. I think you should report it to WordPress support. I hope it clears up for you soon! Anyway, thank you for your comment, and I’m very glad you enjoyed reading about this lovely cross! Once again, thanks for the mini-trip to Scotland, Jo! Under such lovely blue skies as well…the images and stories take my breath away! Thank you, Hank! It was a beautiful morning when we took those pics – one of those special days when everything was extra-beautiful. Glad you enjoyed the little adventure! 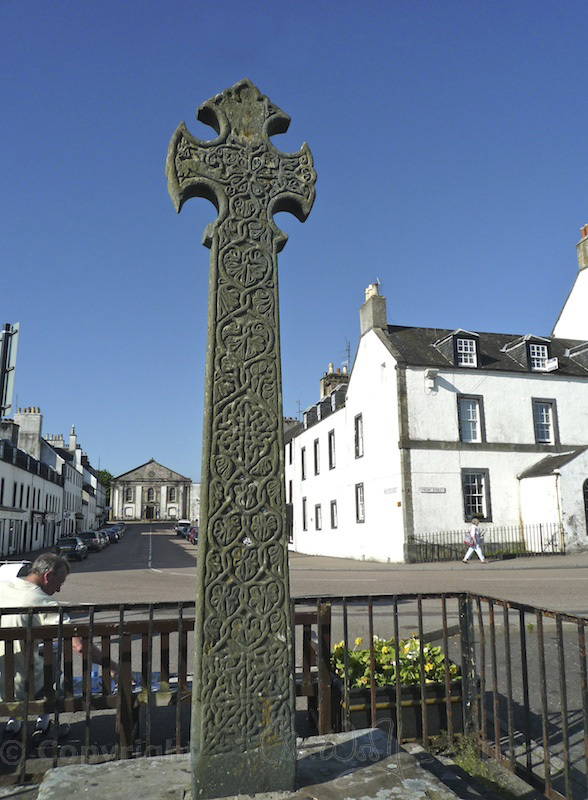 I’m sorry to say I don’t remember seeing this cross in Inveraray although it’s a few years since I’ve been there. The carving is beautiful, I often wonder when I see these old carvings if the carver made any mistakes and either started a new stone or managed to cover them up somehow. The patterns look so perfect and yet one little slip… I had no idea the entire village had been moved, that’s remarkable. Like you, I missed it completely on more times than I would care to admit! You’d think it would be easy to see! It certainly is beautiful. I do wonder about the carvers – Iona was a centre of craftsmanship from early times, so this one might have been trained there. Yes, Inveraray was a ‘new town’ – at least, in the 1800s! Thank you, Lyn! Inveraray is a lovely place, especially early on a Sunday morning when these pics were taken. Like you, I love the views you get as you come over the bridge past the Castle. This was a nice tour of such a pretty town and the photos and history lesson are great as always. To me, when I envision a castle, this is what I see. Neato! Thanks, David! 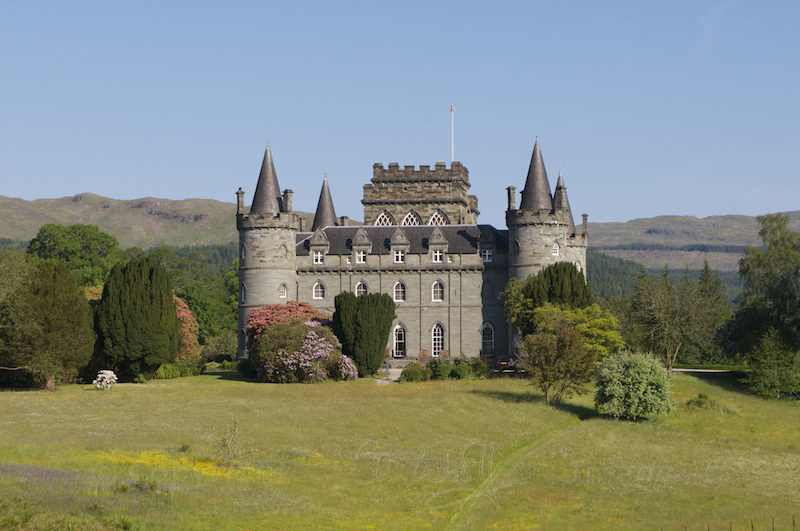 Yes, Inveraray really is a fairytale castle, and it stands in such a beautiful setting with trees and gardens, and the river running alongside. That’s what I like about Scottish castles, I guess – there are so many different variations, from the ruined and abandoned to the romantic and picturesque! An important omission here is the destruction of the town by Alasdair MacColla in December 1644. It’s difficult to know for certain, but this may have been part of the inspiration to relocation and rebuild the town in the 1700s. Thank you for reminding me of this. I have read about Alasdair MacColla and the wake of destruction he left behind him. Do you think that the town was therefore left in ruins for about 100 years? Difficult to say, as I don’t know the extent of MacColla’s damage to the town and I am not sure if any contemporary account exists of the attack. I am only hypothesising that it would have been an influence. I think it’s a shame that MacColla is always so overlooked in Scottish history, particularly is a prominent figure in Gaelic folklore. From what I am aware of, the old Inveraray Castle wasn’t exactly in mint condition when it was torn down in the 1700s. MacColla’s raid certainly might have contributed to that and the overall poor condition of the building may have contributed to Argyll thinking that to really show his power and wealth a new estate and ‘castle’ were required. As for the old town itself, Canmore suggests that a number of buildings were torn down at the time of the building of the new town. It doesn’t however indicate the condition of these buildings nor the overall appearance of the town. Perhaps Argyll would have gone through with the building of a new estate and town anyway, it wasn’t exactly unusual for the time, but I would be surprised if MacColla didn’t have at least a small influence in that decision. I guess we’ll never know for sure unless there are some primary sources available to show otherwise. Thank you for this. I can imagine that MacColla, with his fierce reputation, wouldn’t have overlooked a chance to ransack the castle, so I am sure you’re right. I often think it would be nice to see what the first ‘town’ or settlement looked like, and where the old cross was originally positioned. Jo Woolf do you know of any records of executions that may have been held at Inveraray Cross? Just following up on an old family story.